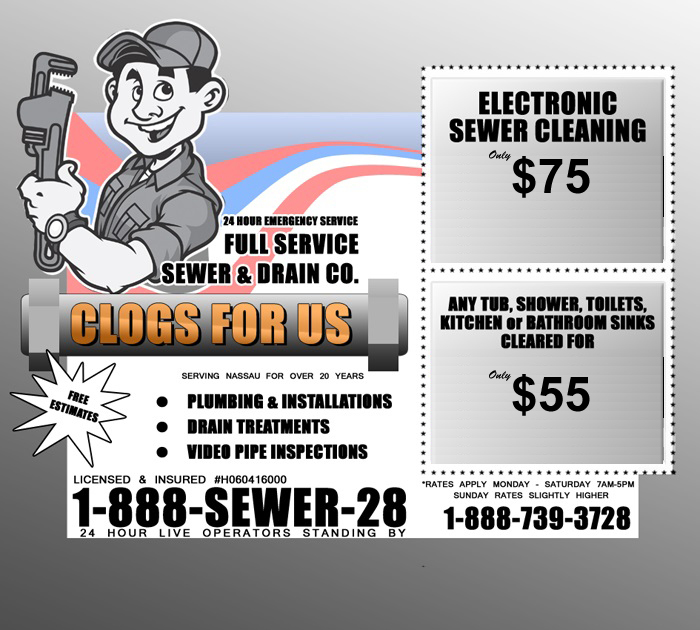 Clogs For Us is a full service Sewer and Drain cleaning company we offer 24 hour 7 day a week Emergency Service. We clean any Sewer from the house to the Street for $69.95 and any Sink, tub, toilet or basin for $49.95. Wo offer Drain enzyme Treatments for the buildup of Soap and grease in the lines. We pump Flooded basements and offer Sewer video Camera services. We also handle Plumbing repairs and installations with free estimates. Our Rates apply Monday through Saturday 7am till 5pm, Sunday and evening hours rates are slighty higher .